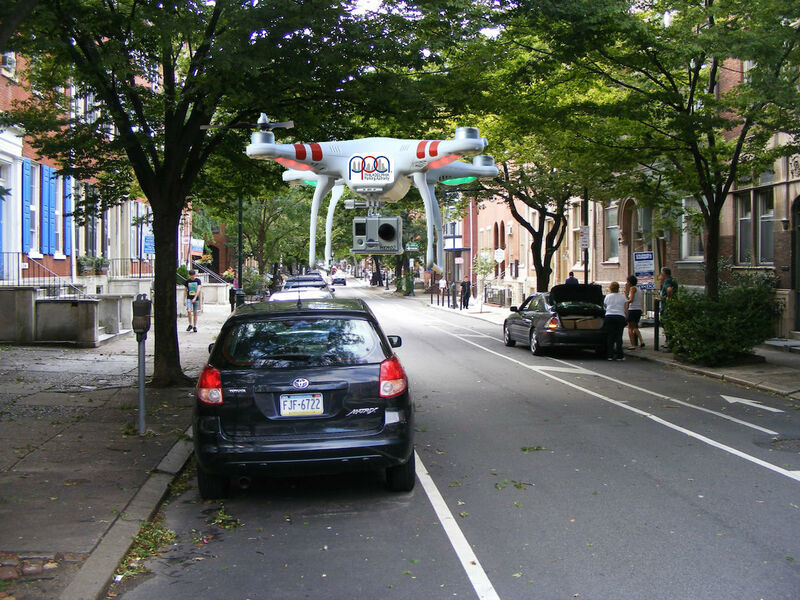 The Philadelphia Parking Authority announced plans Friday to replace one third of its staff with a new fleet of unmanned aerial vehicles that will monitor the streets and assess parking tickets. The revamping of the already-controversial PPA was touted as a “step in the right direction” at a coordinated press conference featuring Philadelphia Mayor Michael Nutter, Philadelphia Parking Authority Executive Director Vince Fenerty, and the Executive Board of the PPA. The plan states that starting in February 2016, nearly one third of the agency’s Parking Enforcement Officers, or PEO’s, will be laid off and replaced by unmanned vehicles that will serve the same purpose. The vehicles, simply referred to as “parking drones”, are programmed to scan for parking passes and apply tickets to illegally parked cars. They will monitor 2-hour parking zones, no parking zones, and all of the meters in their assigned areas. “The drones have undergone significant testing and have proven to more efficiently monitor the streets while providing much needed savings to the city’s taxpayers,” Fenerty said. Fenerty added that the attachment of video recording devices to each drone will provide accuracy and lead to a decrease in contested tickets as well as tickets issued in error. “The computers are programmed not to make mistakes,” Fenerty said. According to the official plan, the first fleet will feature over 1000 drones, all of which will be deployed at different locations across the entire city. They will be equipped with ticket printers and devices to apply tickets to vehicles, as well as radio devices that can signal to tow trucks. The drones have also been equipped with the functionality to act as vehicle-boots when necessary, preventing certain ticketed cars from driving at all. Data projections from the agency suggest that while the drones will subtract costs from the PPA budget, they will nearly triple the roughly 1.5 million dollars of tickets issued yearly in the city. The city will reassess the plan after gathering data for six months, and expand immediately if the operation is successful. A spokesperson for Democratic Mayoral Candidate Jim Kenney was tight-lipped about the plan, but embraced the prospect of increasing revenue for the city. “Jim Kenney wants the room to properly fund education in this city. He is willing to explore all options that would allow that to happen,” the spokesperson said. The unveiling of the plan has not been met without controversy. The AFSCME District Council 33, representing employees of the Parking Authority, has already announced their intention to strike if employees are laid off as established in the plan. “This plan is a gross injustice to the citizens of the city of Philadelphia and hundreds of the public servants who call it home,” said Pete Matthews, President of the AFSCME District Council 33. “Simply put, this is a human job. It can’t be effectively outsourced to robots, and this city is going to learn that the hard way,” Matthews said. “In an age where the public is growing increasingly concerned with the surveillance state, this marks a step in exactly the opposite direction,” the ACLU said in a statement released Friday. “Citizens are already feeling this serious invasion of their civil liberties, and it will only grow worse as the plan is fully implemented,” the statement added. One such citizen is Margaret Harris, who claims that her family’s minivan sustained severe damage after being ticketed by a test-drone. Harris found her front windshield shattered in late September with a parking ticket resting among the shards of glass on her passenger seat. “I’ve been looking for answers and I’ve been met with nothing but resistance,” Harris said. She claimed to be completely unreimbursed for the damage caused to her vehicle. A spokesman from the PPA noted that they are “looking into the matter,” but would not make himself available for any further questioning.